View of Urquhart Castle on the northern banks of Loch Ness in Scotland. There has been a settlement on this site for over four thousand years but it was not until the 13th century that a stone castle was built here. 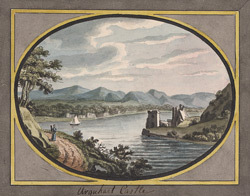 Urquhart Castle was situated on two rocky outcrops at the edge of the loch, ensuring that views across the loch were uninterrupted and that it could be easily re-supplied via the water. The upper bailey at the southern end is the highest point of the castle and building the tower house to the north meant that it could be separately defended even if the castle itself had fallen to the enemy.